The Master Class is opened to pianists – also without Diploma – who have just performed concerts or taken part in competitions. The deadline for sending inscriptions to the Masterclass is 28th of February 2018. If a student is not admitted the inscription fee will be refunded. 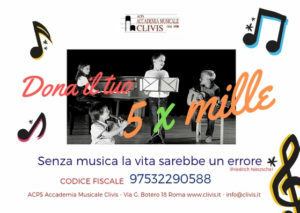 Please, fill out the on-line form on the website www.clivis.it, enclosing a detailed biography and the program for the Masterclass. The receipt of payment of the inscription fee has to be sent by e-mail to info@clivis.it. 4) Eventual applications sent after the deadline will be considered only at the discretion of the artistic director of the Academy, who will assess, in agreement with the teacher, their acceptance in accordance with the timetable of lessons already agreed. Massimiliano Ferrati is one of the most impressive Italian musicians of his generation, renowned for his extraordinary musicality, tecnical strengh and charismatic performances. Prize winner in international competitions members of the World Federation of International Music Competitions (WFIMC) based in Geneva such as UNISA International Piano Competition in Pretoria (special prize for the “best performance of the Russian piece”: Musorgskij’s Pictures at an Exhibition), the “Esther Honens International Piano Competition” in Calgary, the “Guardian International Piano Competition” in Dublin, the “F. Busoni” International Piano Competition in Bolzano (where the jury awarded him also the special prize for “the best Ferruccio Busoni interpreter”), the “A. Casagrande” International Piano Competition in Terni (where the jury awarded him also the special prize for “the best Alessandro Casagrande interpreter”), the “Rina Sala Gallo” International Piano Competition” in Monza, the “Arthur Rubinstein” International Piano Master Competition in Tel Aviv. He has given several recitals both in Italy and abroad, among them: Milan (“G. Verdi” Hall of the Conservatory on the occasion of the celebration of Nikita Magaloff), Padua (“Hall of Giants”), Turin (RAI Auditorium), Paris (Salle Cortot), Venice (Gran Teatro “La Fenice”), Florence (Palazzo Strozzi), Warsaw (State Philharmonia and Lazienki Palace), Hamburg (Musik-Halle), Naples (Teatro delle Palme and Teatro San Carlo), Salzburg (Wiener-Saal), Klagenfurt (Stadttheater), Munich (Kaulbach Villa), Calgary (Jack Singer Concert Hall), Dublin (National Concert Hall), New York (Mannes College of Music), Tel Aviv (Mann Auditorium and Tel Aviv Museum), London (Purcell Room), Leeds (Great Hall of the University), Pretoria (Old Mutual Hall) and Rome (Auditorium of the “S. Cecilia” Academy and Teatro Nazionale). 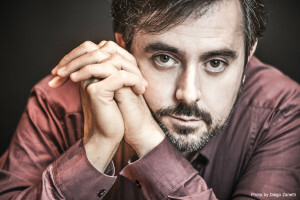 He has performed as soloist with many prestigious orchestras, such as: Calgary Philharmonic Orchestra, Gli Archi della Scala, Israel Philharmonic Orchestra, Moscow Symphony Orchestra, National Symphony Orchestra of Ireland, Orchestra di Padova e del Veneto, Orchestra “Haydn” di Bolzano e Trento, Orchestra Regionale del Lazio, Roma Sinfonietta, Orchestra da Camera Slesiana of Katowice with conductors like: Mario Brunello, Mendi Rodan, Anton Nanut, Robert Houlihan, Christoph Eberle, Bruno Aprea, Alberto Veronesi, Alexei Kornienko, Jan Wincenti Hawel and played with chamber groups such as: St. Lawrence String Quartet, Aviv String Quartet, Trio Rachmaninoff, Solisti dell’Orchestra d’Archi Italiana, TrioLogìa, Trio Veneto and artists as David Garrett, Sergey Ostrovsky, Fabio Paggioro, Stefano Furini, Danilo Rossi, Alberto Salomon, Luca De Muro, Simone Tieppo, Jacopo Francini, Davide Simoncini, Alessandro Carbonare. His performances have been recorded and broadcasted by TVP (Telewizja Polska S. A. ), CBC Radio & Television Canada, RTÉ (Radio Telefís Éireann), Bayerischer Rundfunk München, Radio Allegro Johannesburg, Israel Radio Voice of Music, BBC Radio, RAI Radio Televisione Italiana, Radio Ljubljana. He has recorded the CD Mozart Piano Sonatas for Velut Luna, and for Brilliant Classics two monographic works on the italian composers Respighi and Martucci. Two more CD with Prokofiev works will be released in 2017. Graduated with a first-class honours diploma at the “A.Buzzolla” Conservatory in Adria under the guidance of Mila Zamparo, he studied with very important teachers like the Russian pianist Konstantin Bogino, Paul Badura-Skoda and Sergio Perticaroli (at the Mozarteum in Salzburg and at the “S.Cecilia” Academy in Rome where he received the first-class honours diploma). He partecipated in Masterclasses with Fausto Zadra, Bruno Rigutto, Vladimir Ogarkov, Svetlana Bogino, Trio di Trieste (Dario De Rosa, Renato Zanettovich e Amedeo Baldovino), Piero Rattalino, Dina Joffe, Franco Rossi, Pier Narciso Masi. He gives Master Classes regularly in Italy and abroad (New York – International Keyboard Institute and Festival, Kiev – Ciaikovskij National Academy, Tokyo – Showa University) and takes part in Juries in International Piano Competitions such as “A. Casagrande” – Terni, Sydney, “Luciani” – Cosenza. He is piano professor at the Conservatory “Agostino Steffanii” in Castelfranco Veneto.